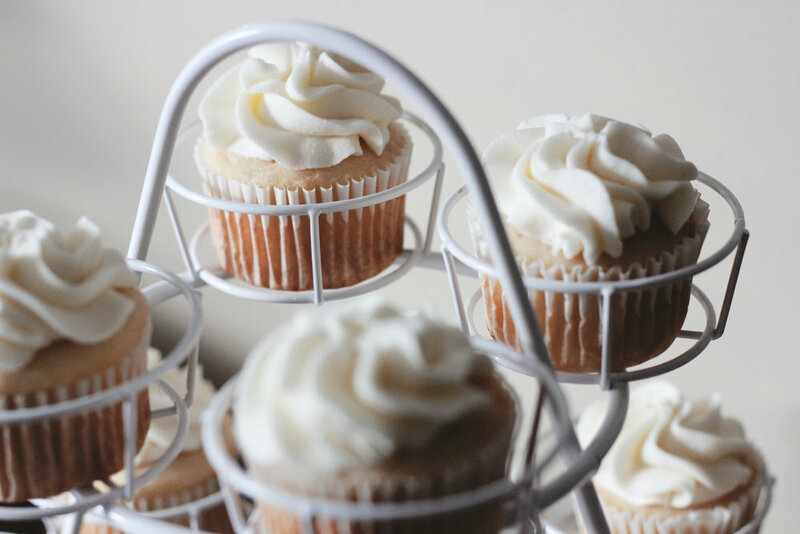 What better way to enjoy baking with coconut oil than with these creamy coconut cupcakes? They're perfect for a light and fluffy afternoon tea, special occasions, or just a treat for yourself. We recommend serving with a pot of Calming Peach or classic Earl Grey tea. So delightful! Preheat oven to 175°C and place cupcake liners in a standard cupcake muffin pan. Sift flour, baking powder and salt. If you don't have a sifter, then place the three ingredients in either a colander or strainer over the mixing bowl. Shake over the bowl to sift. Cream the coconut oil and sugar on medium for 2-3 minutes. Add the eggs one at a time, beating after each one, then add the vanilla extract and one cup of coconut. Next, add half of the pre-measured flour and the buttermilk. Then add the rest of the flour and mix well. Use an ice cream scoop to pour the batter into cupcake liners and bake at 350 for about 18 minutes or until golden brown. Let cool on a baking rack. For the frosting, "Cream" the coconut oil for 2 minutes. Unlike butter, coconut oil melts quickly, so don't microwave or set it out early to get soft. Add in 1/4 of the powdered sugar, the vanilla and 2 tablespoons ofalmond or coconut milk and mix until nice and smooth. Keep adding powdered sugar slowly. Alternate with tablespoons of almond or coconut milk as needed until everything is combined. Now it's time to frost your cupcakes and enjoy!